Hawaii’s medical marijuana patient rolls continue to grow, rising 17% in 2018, with the vast majority of adults in the program seeking relief from severe pain. More than 20,000 patients 18 and older, or 85%, reported severe pain as a qualifying condition for MMJ treatment. Among those adults, severe pain was followed by persistent muscle spasms and post-traumatic stress disorder (PTSD). Patients 17 and younger are most commonly treated for seizures, PTSD and epilepsy. Hawaii’s medical marijuana patient rolls added 3,467 new patients to reach 23,746 patients as of Dec. 31. Dispensaries stand to benefit from a new patient base as the state prepares to implement Act 116, allowing registered MMJ cardholders from other states to obtain a 60-day Hawaiian medical marijuana card. To be eligible for reciprocity, out-of-state patients must have a valid medical registration card from a U.S. state or territory that has been issued to treat one or more of the conditions on Hawaii’s qualifying list and a valid government-issued ID from the same state. Although the timeline for implementing the program is hazy, the state plans to launch the application process this month. Honolulu County, which includes the most-populated and highly visited island of Oahu, is home to the most registered patients, at 9,775, and the most dispensaries, with three operating and a fourth slated to open in early 2019. 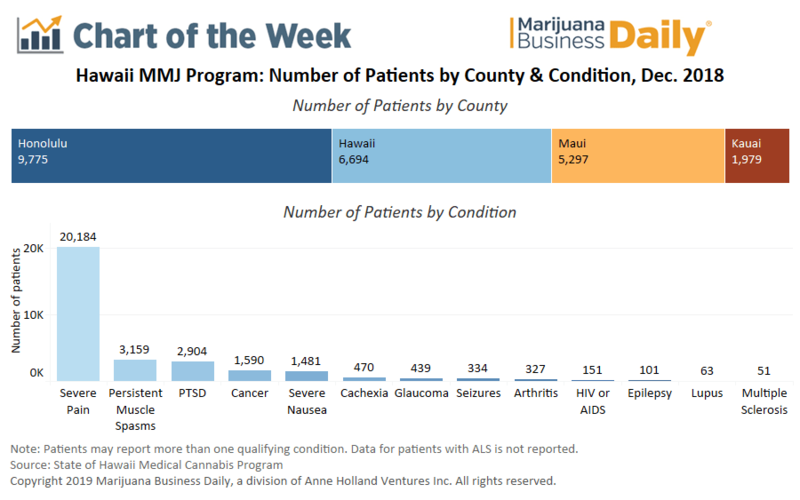 The county of Hawaii – the Big Island – has just under 6,700 patients. After years of delays, the island’s first medical dispensary opened in Hilo on Jan. 16 of this year. Three additional dispensaries plan to open on Hawaii in 2019 in Waimea and Kona. Maui’s 5,297 patients are served by two dispensaries, both located in Kahului. Kauai is home to just under 2,000 patients with access to one dispensary in Kapa’a. Of the 234 physicians and advance practice registered nurses registered to recommend medical cannabis to patients, 152 (65%) have done so to date. Hawaii currently has 14 qualifying conditions for MMJ. A petition process to add new conditions closes Feb. 20. The state health department estimates that 5,000 out-of-state visitors will apply for a temporary MMJ card during the first year of the reciprocity program.